This is a great idea for DIY low cost storage space. They’re simple enough anyone can build them. 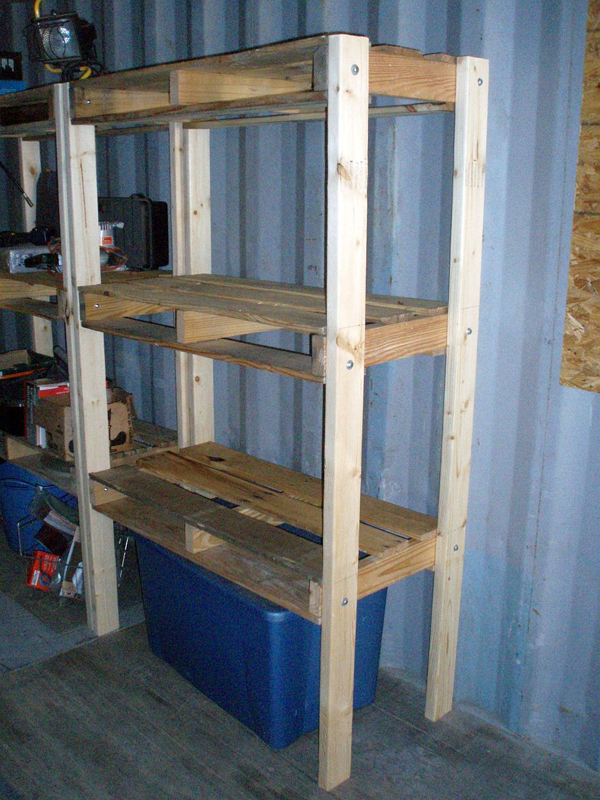 If you need a lot of shelving units, then it might be worthwhile to cut the cost in half by using 2x4s from oversized pallets (you’ll have to search around a bit to find them), and bolts or strong screws from yard sales or auctions. Bolts would be much easier to work with since it’s quite difficult to screw into old, dry pallet wood. Our Natural Building Blog has loads of info on building with pallets. Use the built-in search engine on the right side of the page and search for the word pallet. I think you might find this video series interesting. It’s a pallet shed built with mortised and tenon joinery. Blog post nominee, if you choose? Part 2. Cladding exterior. Installing the clapboard with a running bond pattern would have produced a stronger wall, but it’s still pretty strong even with all the clapboard joints lining up. Part 3. I’m not a fan of his choice for wood stain. It’s mostly free and produces a nice appearance, but it’s toxic as @#$%! Love the Scarf Joint, even if there are easier faster methods, gotta love a good scarf joint in a building. Part 4. 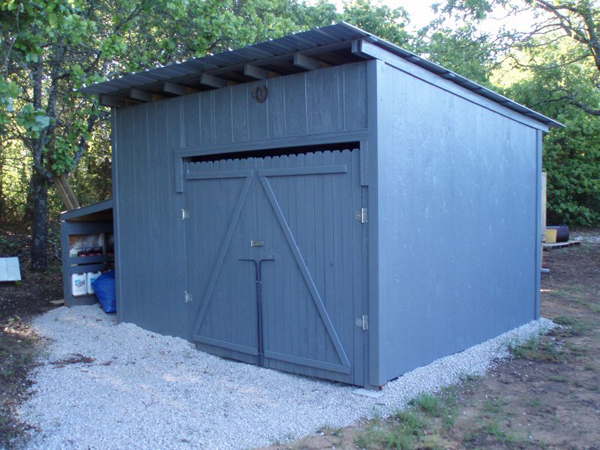 55 Gallon Drum metal roofing. His sheet metal press is very “redneck” but effective. Part 5. Homemade Roll Up Door. Made from pallets. Gotta love how he strategically uses a cardboard priority mail box as a screen to prevent viewers from seeing most of the junk on his workbench. LOL. The nail hinge parts are interesting. Part 6. Grand Finale. Interesting Shed. I don’t accept that he paid $0 for it, though. He used brand new roofing felt on the walls, and new OSB sheeting on the floor. Plus new staples to attach the clapboards. Still, it’s a very VERY inexpensive shed. I love the creative engineering. This guy would be fun to work with on projects. The final shed looks good. I just skimmed the final video is all. Will look again later. Thanks. We need more projects like this and the buildings in our latest blog post about Argentina. Off topic: I just noticed that we have over 10,000 comments on our blog now. That’s a major milestone.